Previous chapters, particularly 4 and 5, are inextricably linked to this object analysis. When I interact with the three-dimensional plastic object, I am in fact operating in four dimensions: I remember the period when this object did not exist, when I was involved in the process of its creation, and when I was interacting with the metal meat grinder. Object analysis (or any other sort of analysis) does not happen in a vacuum, and my involvement in the creation of this object underlines the subjectivity of the enterprise. Photograph 15. 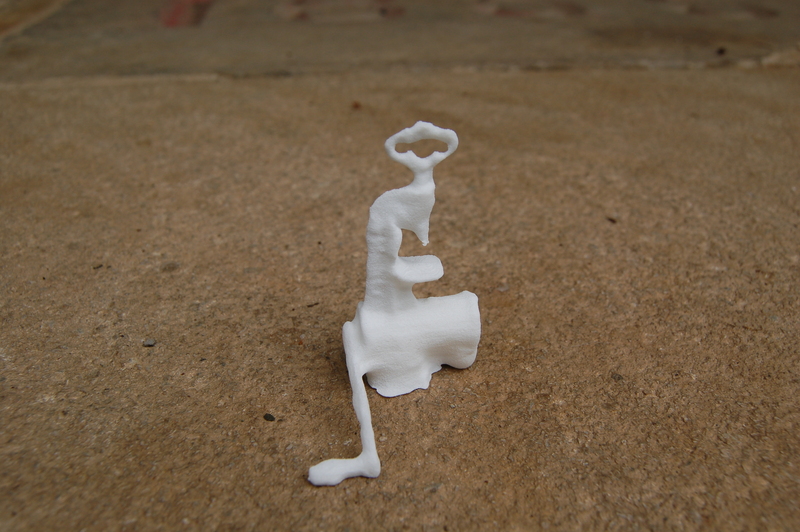 Printed meat grinder, angle similar to the photoset used for model generation. The photographs of the printed model were all taken outside on my front porch using the Nikon DSLR. Photograph 16. Printed meat grinder, view of hand crank. Photograph 17. 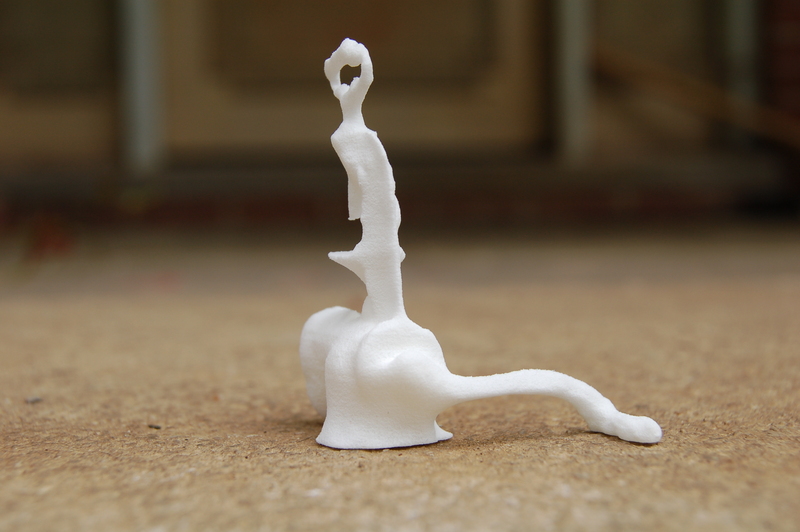 Printed meat grinder, view of goiter and drum depressions. Photograph 18. Printed meat grinder, view of whorls and gritty texture. The form is eclectic. Some portions hint at orthogonal precision, while others are decidedly organic in appearance. Or, less charitably, melted: the fact that the object is plastic, rather than a material with a higher melting point, brings this interpretation to mind. 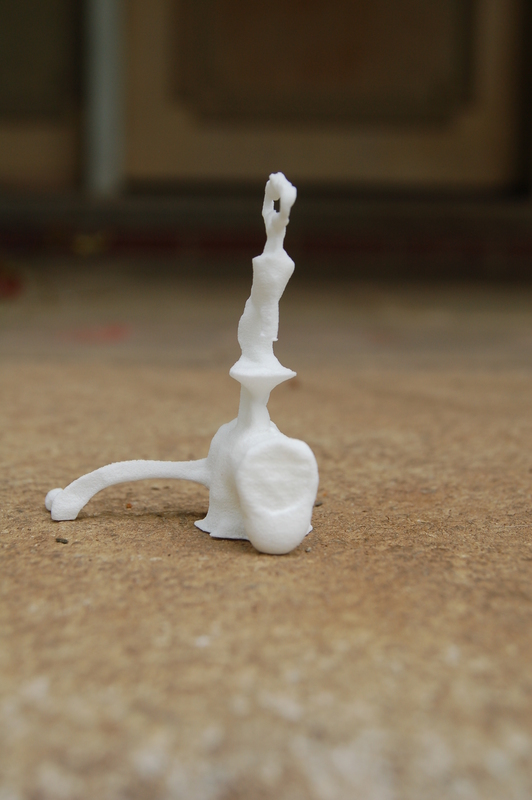 Melting plastic is a known risk in a normal household environment. I have inadvertently reformed plastic spoons while cooking, and suspect it is only a matter of time before one toy or another finds itself fused to the bottom of the toaster oven. The melting point of this particular plastic is in the mid-300s F (right around cake-baking temperature) and it will begin to soften at slightly lower temperatures (cookie baking temperatures).1 Had the object been metallic, the rounded shapes might have implied longevity and wear. Of course, the texture of the object argues against the material being melted or worn, but my prior experience with materials almost unconsciously informs the similes I use. The provenance of the object is well-known and documented. The creation of the 3D model commenced on February 10, 2014, when I photographed the metal meat grinder at the Germantown Historical Society. At various points in March, April, and May I played with 123D Catch and, at the end of May, I exported a model to Meshmixer and made a final round of edits before submitting it for printing. It was fabricated by Shapeways some time between May 31 and June 6, 2014—the dates I uploaded the 3D model and received notification that the object had shipped, respectively. 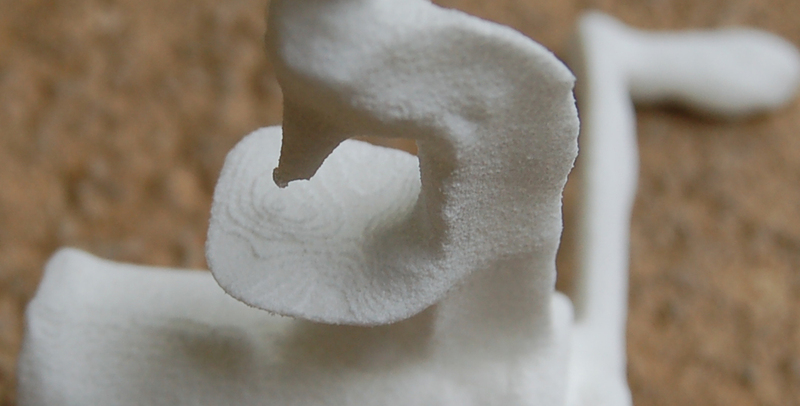 Observations about the object yield more information when considering the form of Rachel Wilson’s meat grinder and the process of modeling and printing. The ridges along the vertical piece give a hint of where “Made in the U.S.A.” appears on one side of the meat grinder. The horizontal striations are an artifact of how the material was laid down during printing. The whorls are probably a result of my efforts to heal and smooth holes in the 3D model, making the comparison to an elevation map especially apt. The model’s listing appearance is expected, as it was present in the initial renderings from the photoset and I made no effort to straighten the model. The jagged appearance of the screw and base, as well as the lopsidedness of the top of the screw, are more a testament to my amateur modeling efforts than any limitations of the printing process. The goiter is the greatest such indication, both in absolute size and deviation from the appearance of the metal meat grinder. The choice of material, including color and texture, were chosen to minimize cost, as were the final dimensions. The context of creation does much to explain irregular or dissonant elements of the design. Traditionally, material culture studies—and object analysis methodology in specific—are used to fill in blanks.4 By creatively piecing together information from a variety of sources, we can speculate upon human/object interactions that may not be directly addressed in written records. In this case, some of that creativity at first appears absent: speculation is unnecessary when I am in possession of a 3D model, Shapeways invoice, and thesis prospectus. Two important points justify the object analysis: the printed object should not be viewed independent of the context of its creation; and however much we already know, a close examination of objects can always reveal additional insights into the object or the humans who create, use, or analyze it. Originality and subjective reactions are issues which are explicitly addressed by the analysis of the printed meat grinder. My analysis of the meat grinder upends aspects of Prown’s methodology. The initial phases of investigation are designed to minimize “distorting biases”—Prown was concerned about the investigator’s cultural perspective, but my highly individual perspective also distorts.5 A different investigator would not introduce those particular distortions. The extreme nature of this example forces a confrontation with the concept of a minimally- or unbiased investigator. Does such an individual exist? And would their analysis be useful? Objects are, after all, created by humans for human purposes. Investigators use human senses and research techniques to discuss human creations and interactions, for presentation to a human audience. That audience is initially comprised of temporal and cultural contemporaries, but over time the analysis will become a historical document, read by individuals increasingly removed from the writer by time and culture. The analysis of the object becomes not merely a record of the object, but a record of the investigation itself, and the investigator becomes part of the story of the object.6 By investigating an object whose story I already belong to, I am merely hastening this process. The printed object cannot be divorced from the original object. The plastic rendering inherits something from the metallic original: aside from physical attributes, there is the fact that the meat grinder was preserved because it was significant (and gained significance through its preservation). Without the original, there could be no printed object. The knowledge of how the printed object came to exist compels the examination of the original. The printed model compels examination of the original, but also compels the examination of the concept of originality. When dealing with digital objects, references to an “original” are meaningless. Even when there is a nod to the cultural importance of the concept of an original, copies are held to be “identical and indistinguishable” from it.7 Completeness of meaning and replicability are all-important.8 The printed meat grinder is an incredibly interesting hybrid object. There is an original, physical artifact. There is an intermediate digital model. And there is the final printed object. The plastic meat grinder is quite different from the metal meat grinder (and, for that matter, the 3D model), neither “identical” nor “indistinguishable.” The concept of an original—of distinct iterations which much be assessed independently—is practically applicable. An object analysis of a plastic object is as legitimate as the analysis of a metal object. Its existence justifies the exercise. We should not ignore the fact that the 3D model can be used to print a second plastic meat grinder to the same specifications as the first. The .obj file uploaded to the Shapeways server is identical to the one on my laptop, and the same material could be used to fabricate duplicate models—just as the metallic siblings of the meat grinder can be purchased on eBay. Uniqueness was not an attribute of the original meat grinder and is not an attribute of the plastic model. The metal meat grinder was meant to distill the important features of a kitchen tool, and transmit certain information and expectations to a young audience. The digital files and plastic model are my distillation of which aspects of the meat grinder are meaningful. The plastic model strikes me as a very good physical representation of the 3D model, less so the original object. The idea that each iteration should induce loss is not surprising.9 But it is not only loss which is introduced. Visually, the plastic object looks less like the metal meat grinder than the pictures; but unlike the images, the plastic object also exists in three dimensions. The whorls on the plastic object are unexpected and call attention to a part of the technical process. Digitization and materialization encourage interaction with the original object, but also the intermediate digital and final physical object. On a broad level, the photographs, digital files, and printed model are the result of my choices about which aspects of the meat grinder were essential to digitize and materialize. As noted in Chapter 3, those choices can be influenced by practical concerns or the type of question one wishes to ask of an object. The photographs and files generated by 123D Catch and Meshmixer are necessary intermediaries between the metal and the plastic objects. But they alone cannot exactly reproduce or represent the plastic meat grinder. They are evidence of the original and the process of the printout’s creation, both archival description and records. They attest to a conscious process, a series of decisions. A small plastic copy of the meat grinder did not simply appear without effort or intent; nor did the metal meat grinder come into existence—or into Rachel Wilson’s childhood home or into the Germantown Historical Society—independent of human will. The fact that I created the object might initially seem to make deduction and speculation unnecessary or irrelevant. There are, apparently, few blanks to be filled in: the specifics of the object’s creation, including the creator’s intent, is known; while they may be recorded, they need not be researched or speculated upon. Object analysis is, however, a flexible and reflexive process. The amount of information known simply permits more confidence in assertions, a solid foundation upon which to take additional steps. Object analysis is subjective, and the fact that I am well-acquainted with the creation of the object means that my subjective responses attached to the object before it even existed. “Meeting” the object was a significant encounter, but not the first. That divergence from typical object analysis provides an opportunity to consider not just the object’s “life” but the time before it existed, and focus upon the ways in which a particular perspective shapes our understanding of an object and its relationship with people. My emotional response in particular cannot be easily separated from the process of creation. There is definitely evidence of the IKEA effect: I am pleased that I was able to translate photographs into a physical object. I have written thousands of words about what is, ultimately, a malformed plastic tchotchke with limited functional or aesthetic appeal. I am also disappointed. I was not expecting to make a shockingly precise replica of Rachel Wilson’s meat grinder, but as often happens when trying something new I had secret hopes of discovering a prodigious talent. Evidence that my skills with 3D modeling software do not approach the magical is upsetting to my inner six-year-old, who has still not forgiven my failings at dancing, skiing, and karate. Even the more pragmatic adult is particularly annoyed by the goiter, because it is the result of inadequately reviewed work at the end of the process—or, less charitably but more accurately, the result of impatience and carelessness. My emotional response to the process—to my work (a verb)—overshadow the response to the work (a noun) and render the object itself almost incidental. This is not the way object analysis typically operates, but I feel it serves as a useful reminder of the subjectivity baked into the process. The self-centeredness of this analysis is an extreme example, but also provides an opportunity to highlight the way in which subjectivity and self-awareness can influence the process. Prown’s methodology encourages a careful, reflexive, and respectful approach to objects and their context. These values can be applied even when an investigator is intimately connected to an object, as is the case with the printed meat grinder. As the creator of the analyzed object, I am well-positioned to know the answer to basic questions surrounding its material composition. More importantly, my relationship with the object—from conception through creation, and only later “meeting” the plastic model—provides a perspective not typically explored in object analysis.